Description: 41T rolls west at Miller Beach Rd, sailing through the corn with 36 cars. Description: 398 heads towards Flint. Description: CN 5668 South, manifest freight climbs the last hill before Duplainville. Description: Monster 10,000 foot long A431. Description: Southbound Extra Grain train. Description: Going past Tuscola grain. 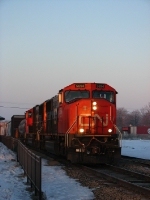 Description: A CN freight heads south on the IHB at CPLG.